PCWorld raved about Microsoft Surface Pro 3’s display. Now, professional display analyst Raymond Soneira has done so as well, proclaiming Microsoft’s tablet among the best in display quality. In a report released Wednesday, DisplayMate’s Soneira said the Surface Pro 3 joins the top tier of tablet displays, just behind the Samsung Galaxy Tab S 10.5. Soneira called the Surface Pro 3 “one of the very best and most accurate displays available on any mobile platform and OS,” with the most accurate on-screen colors of any tablet that the firm has ever measured. Microsoft’s Surface Pro 3 measures 12 inches on the diagonal, a supersized tablet that packs in 3.1 megapixels in a 2,160 x 1,440 IPS display that’s oriented in the 3:2 format. That’s 89 percent larger than the Kindle Fire HDX 8.9, the only other display to win "very good” to “excellent” rankings in all of DisplayMate’s evaluations. While the tablet’s 216 pixels per inch ranks below that of the iPad Air (264 ppi), Soneira said that, in effect, didn’t matter—pixels weren’t visible. Normally, the larger screen real estate would result in a correspondingly larger power draw. But at 371 nits, the Surface Pro 3 isn’t as bright as some competing displays—a fault Soneira excused by noting that the size of the display makes it less suitable for using outdoors in bright sunlight. But the Surface Pro 3’s display consumes just 3.5 watts—a tenth of a watt more than the Kindle Fire HDX 8.9’s much smaller screen. 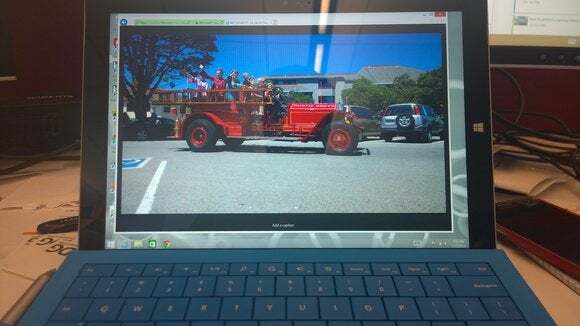 It’s the color accuracy, however, where the Surface Pro 3 shines—and when paired with images captured by Microsoft’s newly acquired Lumia phones (above, top) the results can be stunning. According to DisplayMate, the color gamut is 97 percent, with a 2.1 Just Noticeable Color Difference (JNCD). As Soneira notes, color accuracy is important for both creative professionals as well as consumers, whether viewing photos or trying to buy shoes or other clothes online. Where the Surface Pro 3 falls slightly short is in display brightness and screen reflectance—again, areas where the Surface Pro 3’s indoor use and flexible kickstand help mitigate any deficiencies. The bottom line, then, stands: We called the Surface Pro 3’s display “breathtaking,” and research now backs that up. 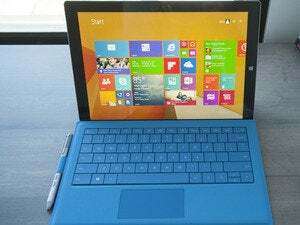 With an improved kickstand and keyboard, the Surface Pro 3’s productivity increased markedly. Yes, Microsoft has priced the Surface Pro 3 at a premium, but more evidence is emerging that you’re getting what you paid for.